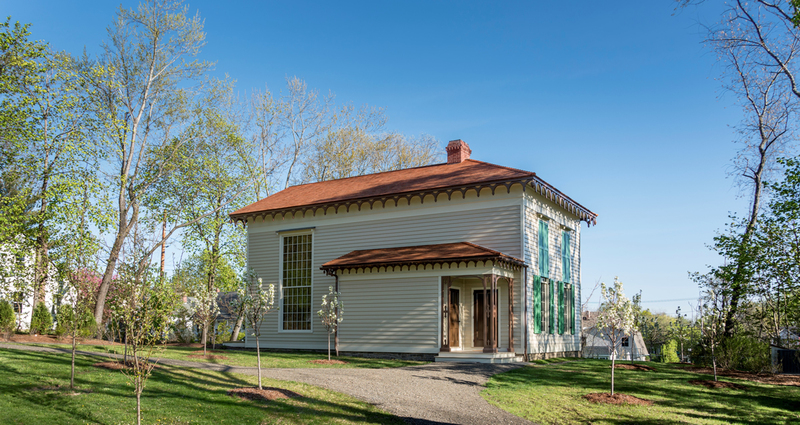 On May 1, 2016, the reconstruction of Thomas Cole’s New Studio officially opened to the public. Originally built in 1846 according to Thomas Cole’s own design, the building stood about 75 yards from Cole’s home in Catskill for 125 years. Tragically, it was torn down in 1973 after falling into disrepair. Now, after many years of research and a successful capital campaign, the building has been reconstructed and is open to visitors. Visit Reconstructing Thomas Cole’s New Studio for a behind-the-scenes look into the process. The interior of the New Studio features a state-of-the-art exhibition space for displaying changing exhibitions, and its open floor plan provides a flexible space for lectures and educational programing. The building enables the Thomas Cole National Historic Site to effectively serve as a catalyst for the burgeoning national and international interest in 19th century American landscape painting, an outstanding destination for visitors to and residents of the Hudson Valley, and a resource and inspiration for future generations of scholars, collectors and artists. After breakfast we were invited to the studio. 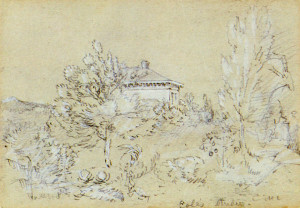 It is a new building about 1000 yards from the house, large and commodious, with a neat little porch and a wide open hall before entering the painting department. It is built in the modern florid style. We Entered; it seemed as if Mr. Cole would be in in a few minutes for every thing remains as when he last left painting. The picture he last painted on yet stands on the Easel, The brushes he painted with that last day are there; his paint table looks as when he was there – There too is the sketches upon the floor, and standing by the Easel as he left them – There are his books, his writing table, portfolios, and in short I felt like asking, “when will Mr. C be in,” Though the man has departed, yet he has left a spell behind him that is not broken, as you may sit there upon the sofa, and look upon his works, we will feel more than ever the devotion, genius and spirit of the man. Every thing breaths so much candor of will, truth of purpose, and love of the refined and beautiful, that we feel a kind of reverence there, we instinctively feel like taking off our hats, when we enter although He is not there. The Trustees and staff of the Thomas Cole National Historic Site completed a new strategic plan in 2010 focusing on transforming Thomas Cole’s home and studios into a leading center for education and scholarship about the artist and his influence on America’s cultural landscape. These goals will be achieved with dynamic and relevant programming, supported by an expanding permanent collection and well maintained physical facilities. The New Studio is part of the overall site-wide plan to prepare the organization for a strong and sustainable future. Many pieces of the plan have already been implemented – including a site-wide landscape restoration, upgrades to parking and paths, reconstruction of the historic stone wall and fence along Spring Street, and relocating staff offices out of the 1815 Main House and into a different building on the property. The reconstruction of the New Studio will provide the Thomas Cole National Historic Site with many of the remaining key pieces of the plan: an interior program space that serves as a museum-quality gallery for special exhibitions and a lecture hall for a variety of programs and events. It will serve all ages and segments of the community – students and teachers, families, scholars, area businesses and visitors from across the country. Most importantly, the New Studio project will ensure that present and future generations can learn about the profound impact of Thomas Cole and the Hudson River School. Support provided by Market NY through I LOVE NY/ New York State’s Division of Tourism as a part of the Regional Economic Development Council awards.